It’s been an incredible year for women in our industry. We continue to stand in our truth, shake things up, smash ceilings, and create art that resonates deeply. 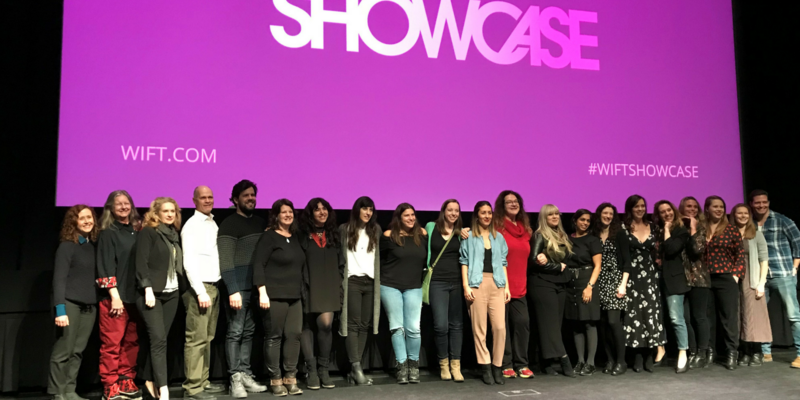 The seven projects screened at the 9th annual WIFT-T Showcase illustrated the strength of diversity, and breadth of imagination in our community. To our members, thank you for creating bravely and sharing your work with us. We would also like to thank our Presenting Partner: Urban Post Production; Supporting Partner: Sim International; and Event Partner: Deluxe Toronto. Last night, we had the honour of presenting three awards of excellence: Best Screenplay, Best of Showcase, and Audience Choice. Supported by the Toronto Screenwriting Conference, CBC, Foundation for WIFT-T, and Hollywood Suite. The winner of the Best Screenplay Award received: a complimentary pass to the 2018 Toronto Screenwriting Conference; a copy of Final Draft Pro; a day in the writer’s room of CBC's new original comedy series Little Dog, as well as a $2,000 cash prize from the Foundation for WIFT-T made possible through a donation by Hollywood Suite. Supported by Deluxe Toronto, Mongrel Media, Foundation for WIFT-T and Hollywood Suite. The winner of the Best of Showcase Award received: access to postproduction services valued at $2,500 from Deluxe Toronto; a meeting with Andrew Frank, Vice President, Sales and Acquisitions at Mongrel Media; and a $2,000 cash prize from the Foundation for WIFT-T made possible by a donation from Hollywood Suite. Supported by Dazmo Camera, Dufferin Gate Studios, the Foundation for WIFT-T, and Hollywood Suite. The winner of the Audience Choice Award received: an equipment rental voucher from Dazmo Camera, valued at $2,500; a studio rental voucher valued at $3,000 from Dufferin Gate Studios; and a cash prize of $1,000 from the Foundation for WIFT-T made possible by a donation from Hollywood Suite. The Best Screenplay and Best of Showcase award winners were decided upon by our volunteer Showcase Selection Committee, comprised of twelve WIFT-T members. Our thanks to our volunteers, staff, board and everyone who showed up to support and champion women's voices. We look forward to your presence next year! PHOTOS VIA FLICKR. VIEW HERE. Photo credit: Julia Batista.